Youve been dreaming a lot about performing, singing and writing your own songs. In a local pub you found a job as a stage builder. Not really something you would like to do but every star has to begin somewhere. Finally, you convinced your boss to do sound checking before the big stars has to perform. Only a few people will actually hear you sing, a few is better than no one right? After you're done, youll be standing in the crowd cheering for your favorite band. You think that no one actually heard you sing but, someone did and he cant wait to tell his manager about your incredible voice. Youve been taking a few piano lessons and you also have been writing a lot. Youre not really ready to show the world your songs and potential singing voice. Your friends however have been pushing you to film yourself singing. You try to ignore them but, how can you ignore them when they secretly filmed you and published on the internet! This publicity stunt earned you a few gigs around your neighborhood. From pubs to wedding ceremonies. After a few weeks of working hard, youve been asked to be a background singer for one of the bands who perform every weekend in the pub you used to work at. 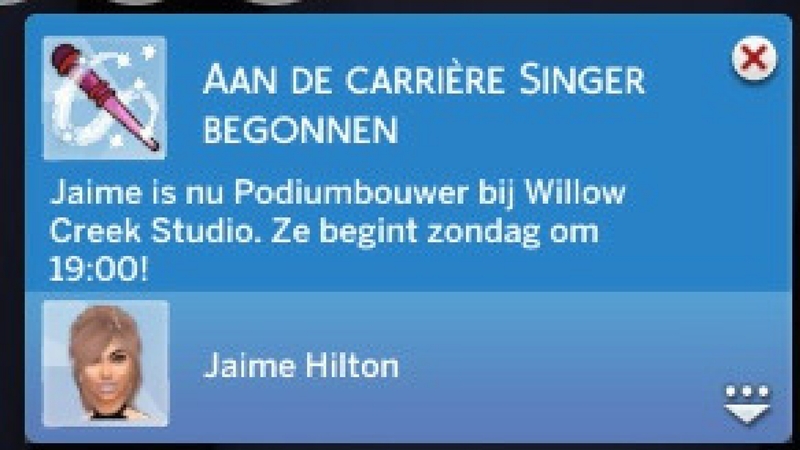 It isnt really what you have planned in your mind but, this way you will perform more and a lot more sims will see you sing. Remember that you thought that no one heard you sing during sound checking back in the days? Well, youre wrong. A manager from Llama Records wrote you a letter saying that he has seen you perform and was blown away by your amazing voice. He wants you to come check in and sing some songs for him and his team. Might there be a record label on the table? They loved you! They loved your voice so much that they offered you to go with them on tour. Youll be their opening act performing your own songs and maybe some duets with the band. 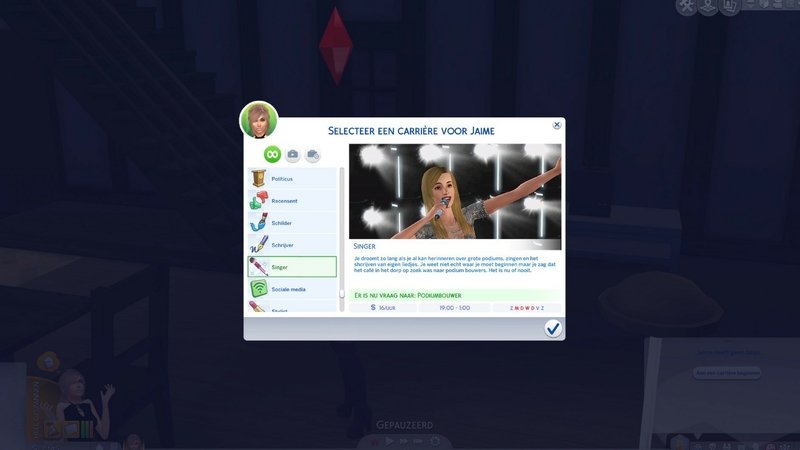 This tour will give you time to grow as a sim and as a performer. Will it always be this amazing or is something lurking around the corner. 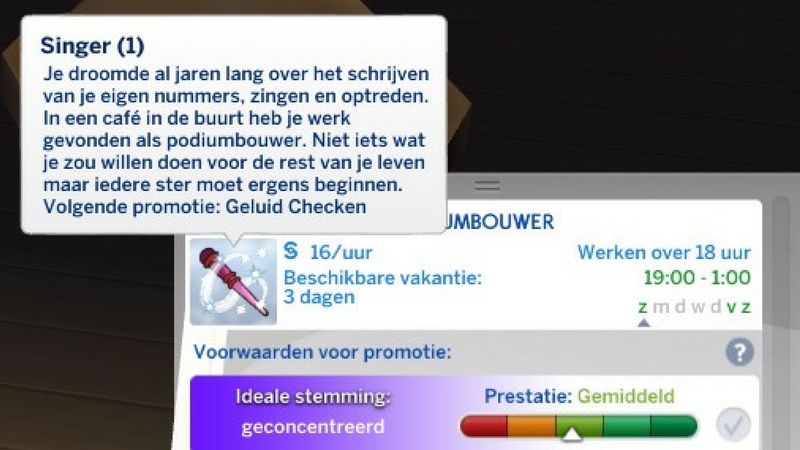 Singing, performing and writing your own songs was your dream job: with dream jobs a lot of nasty things can happen to a sim. Paparazzi are swarming like bees around you everywhere you go, someone has been stealing your songs and rumor has it that the band might be breaking up. Are you able to keep your head in the game or will you fail? Fame hasn't raced to your head in fact you kept your head cool and made the right decisions. You talked to the band and make them realise not to throw away something that they have worked hard for. They ended their tour with a huge hit breaking the global charts. They have been talking about a world tour and you have been offered to go with them but your manager also made an offer to help you out with your own album. You really want to go on a world tour with the guys but, you have to choose for yourself this time. You sit down with your manager and a team of writers to help you out with writing songs for your upcoming album. Do you choose for happy music or for something more personal? Youre album is selling like crazy and you get asked to do interviews, tv performances and magazine covers, even your fans recognize you now. You did it! You followed your heart, started at the bottom but now you are finally here at the top of your career. Fans are screaming, albums are out of stock and everyone is in love with you and your music. Now, youre the one touring the world and selling out stadiums. Enjoy! If you experience any trouble with my career, please let me know. Thank you.